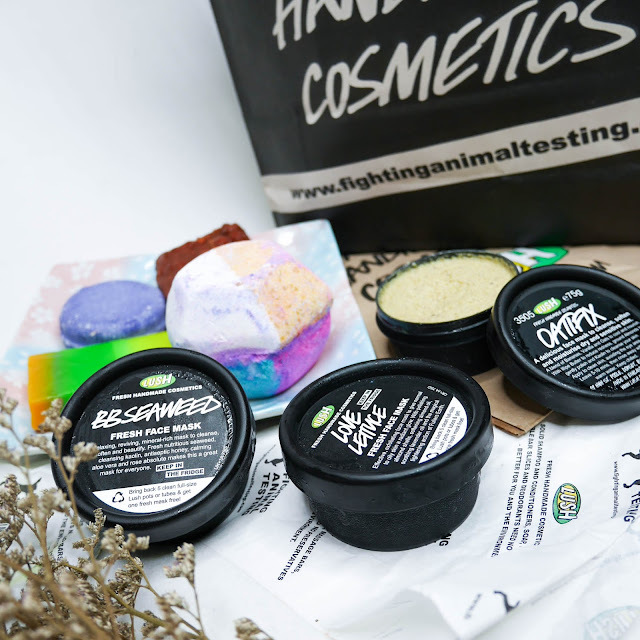 LUSH Singapore Oxford Street range + Fresh face masks! 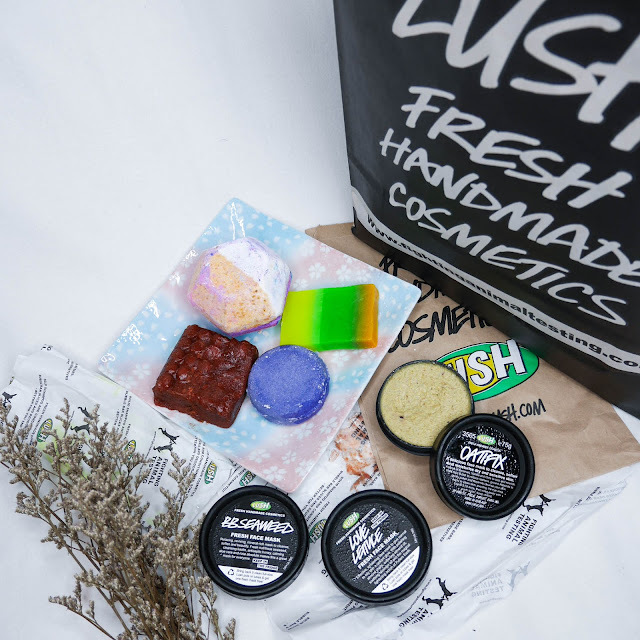 Congratulations to LUSH Fresh Handmade Cosmetics for opening their new largest flagship store on London’s Oxford Street last April! On this celebratory note, they launched more than 200 new products include new bath bombs, bubble bars and even face masks and scrubs! 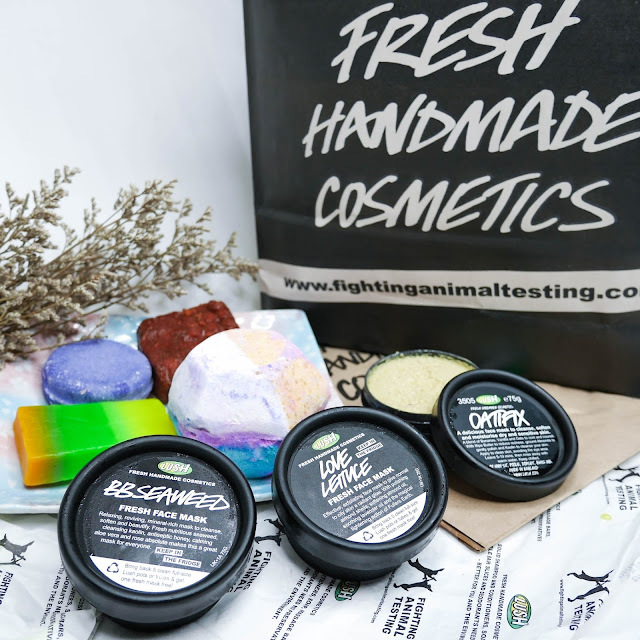 Here I'm holding to LUSH's popular Fresh Handmade Masks - Oatifix, which is practically my FAVOURITE face mask now! Read on to know why! The Experimenter bath bomb ($21) This colorful bathbomb definitely cheers up the mood. 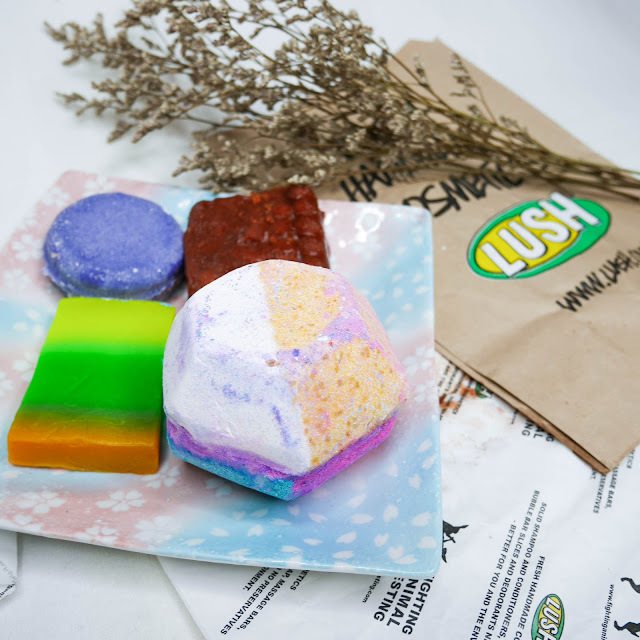 It is multi-layered and sweet, which will create an explosion of colors when dissolved in your bathtub! The Rough with the Smooth ($23) An interestingly named body scrub that comes in a solid form, this sugar based scrub is packed with mumuru butter and caster oil. Be ready to experience smooth, clean and scented skin from LUSH’s infamous Lord of Misrule, black pepper and patchouli fragrance! Layer Cake Soap ($11.50/100g) Maybe something fruity for you? In that case you would love the Layer Cake Soap because of the layers of REAL fruit juices, from raspberry, blueberry, wild grape, orange and pineapple! I’m already imagining the nice scent as I am typing this, hehe. Remodelled Jumping Juniper ($20 / 55g) The remodelled Jumping Juniper is a shampoo bar. Perfect for when hair needs a really deep clean. Juniperberry gets to work regulating sebum production, clearing the scalp. What’s included are calming lavender and antibacterial rosemary essential oils to soothe and cleanse the scalp. Lemon and lime oils give shine, as they help the cuticles on your hair lie flat, enabling them to reflect more light. Make sure you drop by and check out LUSH Singapore’s outlets with more than 200 new products to commemorate the opening of the largest flagship store on London’s Oxford Street! Moving on to LUSH Fresh Handmade Masks, I have three masks here with me: Oatifix, Love Lettuce and BB Sea Weed. I've came to realise these fresh face masks are major love! They are especially more soothing when I take them out of my fridge. Do you know how great it feels when you apply cold masks onto your skin, like how your facial's last step of masking usually works? It's the exact same feeling, and this time round with organic face masks. Save yourself the trouble to blend your own face masks because it can be quite a hassle to find the ingredients and clean up after the mess! Oatifix, is a blend of calming oats, softening mashed banana and ground almonds. This helps to nourish the skin under harsh, dry and even cold weather. Helps to calm irritated and sensitive skins too. BB Seaweed is a best-seller for its soothing and smoothing effects. This locally-harvested, nutrient-rich seaweed nourishes the skin, while finely ground almonds exfoliate leaving skin perfectly smooth. There's a generous helping of aloe vera gel and rose absolute to calm and soothe sensitive spots, and a gorgeous combination of honey and olive oil to moisturize your skin! Love Lettuce is a blend of calming french lavender oil with seaweed and honey to nourish and soften skin, and to balance oily T-zones. It also acts as exfoliation step, which is an important part of good skincare!